First of all, you should visit the largest current market, called ‘Chatuchak.’ It is mind-blowing to realize that this market features fifteen-thousand tent shops and three-hundred and thirty-three million customers daily. You can buy anything at this market, such as: antiques, books, handicrafts, ceramic products, baskets, artificial flowers, clothing and footwear, children’s goods and even gold jewelry. These are just a fraction of the merchandise that local residents sell here. I recommend that you bring an advanced purchase card with you to Chatuchak. 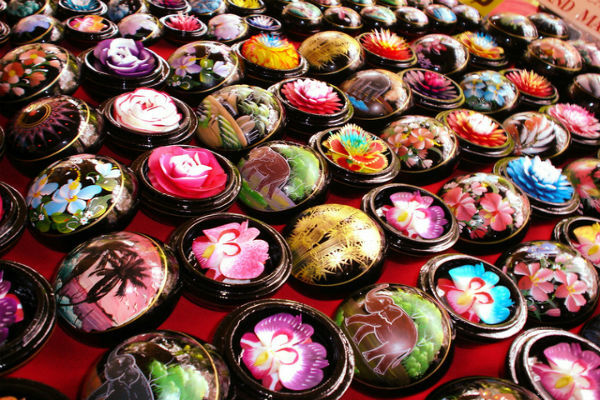 Even better, I recommend that you consider purchasing products from the Chatuchak catalog, since the market resembles a massive labyrinth of kilometers, ring trays and tents, making it very unlikely that you will find what you are looking for. To avoid getting lost, tourists should pay attention to the clock tower located prominently in the center of the market. As they shop, they should consider stocking up on appropriate footwear, especially local sandal wedges. During the Thailand rainy season, weather is unpredictable, threatening rain at any moment, which converts the market into a massive mud puddle. When it is not raining, freely explore the market, buying goods wherever you please, but always with a calm and friendly smile. Thais do not tolerate rudeness and shouting. When you look for jewelry, exercise vigilant caution, purchasing rings, earrings, bracelets and chains only in the retail stores or certified locations. If you overlook this, you may discover at home that you purchased counterfeit gold and silver with an unknown origin. The same is true for antiques and other art pieces. For articles of stone and leather, however, you may buy from anyone, even the most capricious sellers. Articles of stone or leather you can choose for anyone, even the most capricious, relative. If you would like a second recommendation for where to shop and what to buy in Thailand, consider visiting the ‘Caliper.’ This is a series of shops, created by the government, aiming not only to provide local residents with an opportunity to make extra money, but also to encourage craft development in general. Here you will find a wide array of lace shirts, elegant linens, plush cotton robes, handmade bags made of silk and vines and so much more. If you need help representative in Thailand — contact to me.